Mostly, I fear that skipping out on my son's religious education makes me a selfish mother. In time, will he grow to resent the omission? Or, in leaving the slate blank, have we actually given him the greatest spiritual gift of all -- choice? 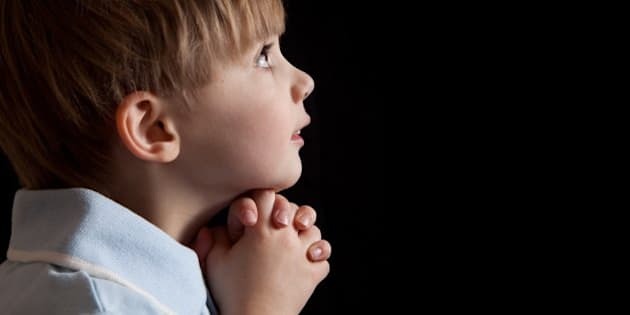 A 5 year old boy saying prayers. Though we were both raised Catholic, my husband and I made a conscious choice to eschew religion the minute our son was born. It stands to reason that since we didn't go to mass, our son wouldn't either. After all, we don't want to be hypocrites. So at the risk of drawing the ire of our respective families, we opted not to baptize our baby. Ditto for First Communion. Over the years, that early decision to go secular has informed every other that followed. Before we could blink, our child started kindergarten at a (public) school. Like many parents, we arrived at this decision cautiously. We arrived at it by piecing together our own past experiences with our dreams of the future. Wouldn't it be nice, we thought, if our son could make an informed decision about his own spirituality when he is old and mature enough to do so, without it being imposed on him from the onset? All well and good. But what happens in the meantime? We try to impart some loosey-goosey version of our Christian values, and hope that something meaningful will stick. Though it's probably naive to think you can cherry pick parts of a religion and discard those that leave a bad aftertaste, so be it. While my son is missing out on elements of dogma, isn't he also missing out on the sense of community and tradition found within the church? As time wore on, though, I have found myself occasionally second-guessing that early decision. While my son is missing out on elements of dogma, isn't he also missing out on the sense of community and tradition found within the church? When you don't belong to a religion, you are basically adrift. You have friends and family, sure, but no spiritual raft. Am I doing my son a disservice by leaving him floundering out at sea with no oar? For those who believe, faith creates order out of chaos, meaning out of meaninglessness. This is especially noticeable when someone dies suddenly of a terrible disease -- as was the case in my family recently -- and loved ones are left blindly grasping for consolation. Mostly, I fear that skipping out on my son's religious education makes me a selfish mother. In time, will he grow to resent the omission? There's no such solace in death for non-believers. As an adult, I am far too cynical and jaded to rediscover religion in my own right, and yet at times I still envy the unflappable, unquestioning faith of others. I wish I could believe all the platitudes: that God acts in mysterious ways, that He only gives you what you can handle. I wish I could convince myself that there is a plausible explanation for why so many bad things keep happening to good people. But I honestly can't.